I can’t believe we’re at the end! The final tutorial…time flies, doesn’t it?! Now I know that many of you have already worked out your own strategy for piecing everything together, which is great! But for people who need a bit more direction, I hope that the following diagrams help. Essentially, the top is broken down into a small number of large sections which can each in turn be broken down into smaller parts that are easy to put together. 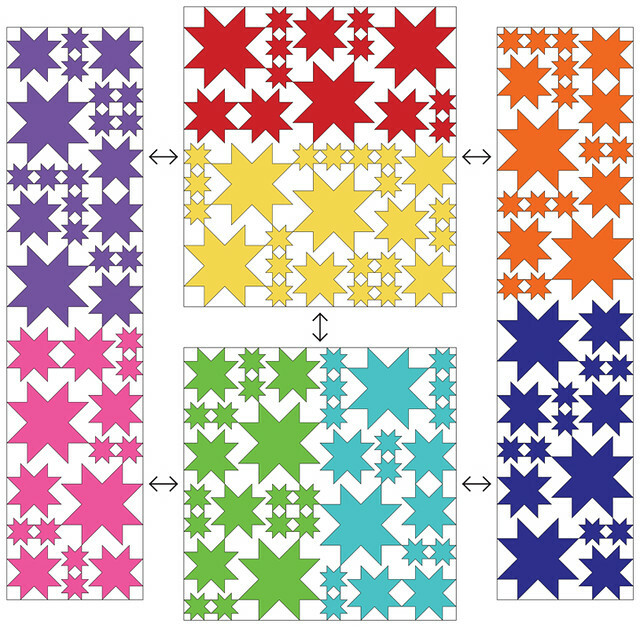 For a throw/twin quilt, there are six (6) sections, and for a full/queen quilt there are two (2) more sections for a total of eight (8). (What? You don’t remember there being a full/queen option?! Well, someone wrote to me asking if I would mind working out a slightly larger version, and I was happy to oblige. I’ll be adding the necessary details to the post about the blank diagrams as soon as I’m done here.) In the following diagrams I am including the extra two sections (the pink and purple on the left side), but if you are making the smaller size then just ignore those. Everything else is the same. 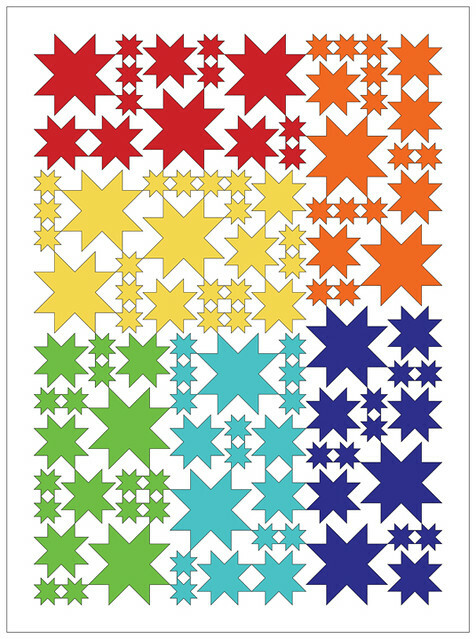 To begin, arrange your completed stars according to the groupings shown below, and start joining them together. At this point, your finished top will be 60″ x 84″ if you are making the smaller size, and 80″ x 84″ if you are making the larger size. If you’d like to increase the size of your completed quilt (68″ x 92″ for the small, 88″ x 92″ for the large) by adding borders, then start with the strips for the top and bottom. For the small they are 4-1/2″ x 60-1/2″, and for the large they are 4-1/2″ x 80-1/2″. Then add the strips to the side. In both cases they are 4-1/2″ x 92-1/2″. I think that this should be enough information, but if you have any questions then head over to the Flickr group and ask them in the discussion thread I’ve started here. I’ll be stopping by shortly myself, since I have lots of catching up to do. I’m sure there have been lots of lovely new stars posted while I’ve been away! I’m still catching up on all my email, too, but I’ll try to answer the questions that have come in by the end of the day. And I’d love it if everyone would join me back here for a little linky party at the end of the month (March 31st) to share their images of their finished quilts. Sound good? share pictures of the *finished* quilt by March 31st??? You mean, as in, quilted and labeled and bound???? Surely you jest. I need to recount my stars because I didn’t realize there was a larger size available and that’s what I’d really like, rather than a twin size. (So, thank you very much for providing this option!) 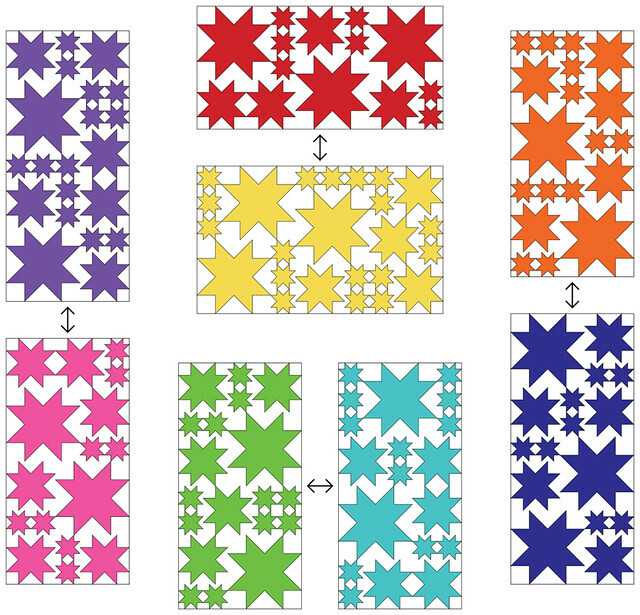 Fortunately, I’ve snagged a few more Sawtooth Star variations from other sites that I can augment your stars with. BUT … I’ll be very fortunate to have the blocks sewn together into a *top* by the 31st. I know I’m not going to have it *quilted* by then. Thank you for the larger size option! I guess I REALLY need to get my top STARTED now. I have all the fabric. I have the desire. I NEED the time. The larger size works for me. I started assembling my own way, but then I can just add the pink and purple sections above, so it’s all good, thanks! Only snag, I have to make a lot more of the pesky 4 inch stars. They look so cute, but are picky to make! Thank you for all your work and organization. 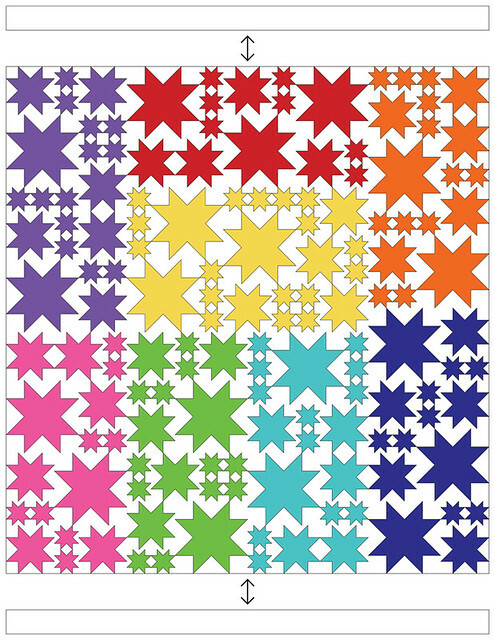 “Pippin Sequim” pointed me to your blog and I discovered your stars quilt. Love, love it. This is going on my to do list. Was directed to your site via Pinterest and I’ve been diligently making my own. I decided to go with more of a square lap quilt size rather than the twin, since I wouldn’t have use for a twin quilt. Took me about three weeks. But all I have to do is add the boarders and my top is complete. Great tutorials! Thank you! Hi Cecilia, if you click on the “Oh My Stars” logo in the right column (near the top of any page on the blog) you will land on a page with links to all the instructions you need. I hope this helps! You don’t have to respond back. 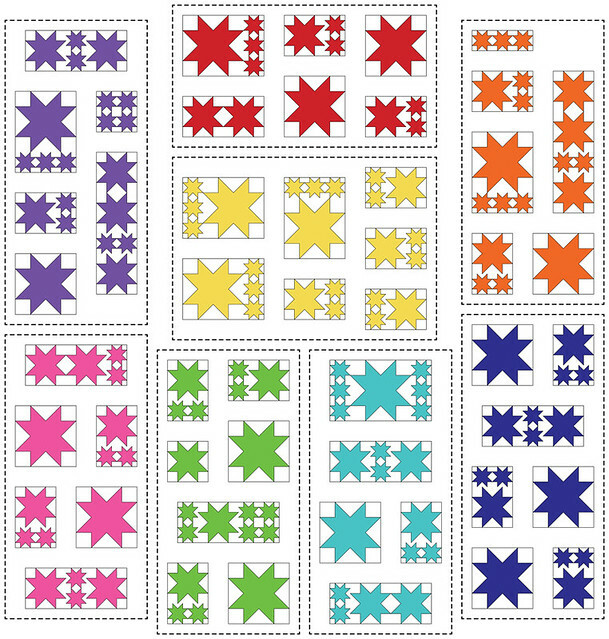 I just wanted you to know that I just discovered “All My Stars” quilt on Pinterest and thought there must be a method to all these stars in all these sizes then I discovered your blog through Pinterest and here is the “map” to the stars! Thank you so much for sharing! Hi I have emailed you but thought I’d try this route just in case someone is able to give me the tip I’m after. This is my first quilt so I’m learning as I go! I’ve completed all the stars and laid them out as per your directions but I’m a little hazy as to how to join up. I have trimmed all my stars so they are nice and square but what I don’t understand is how you match once you’ve reduced the size of one component with the seam allowance. For example once two four inch stars are joined they are not going to be 8″ to join to the medium star so I don’t know how to match them up if this makes any sense to anyone??? i would be really grateful if someone has the time to photograph how they do this as I’ve tried it every which way and can’t get my head round it. thank you in advance..I’m desperate to finish it having started last christmas! Hi. 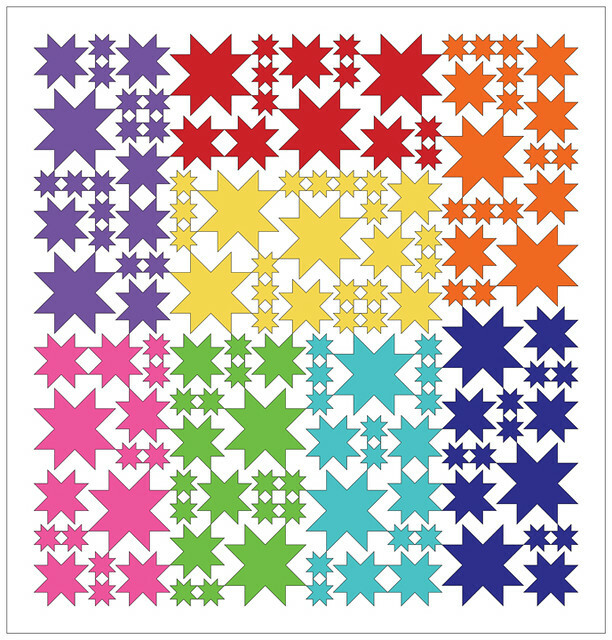 Did you trim your stars down to 4 inches? Because we always allow for a seam allowance. We trim a 4 inch star to 4.5. That allows a 1/4 inch seam. So when they are joined they will fit perfectly with a larger piece. General rule of thumb in quilting is cut your pieces 1/2 inch larger than the size you want so you can have a 1/4 inch seam on each side. 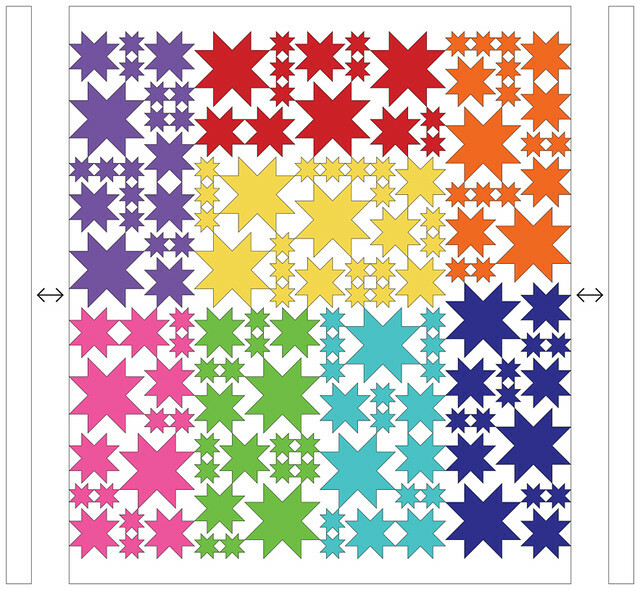 Also don’t forget to press your joined pieces before you sew them to the larger stars. Your seams will come out much better if you do. Because stars have lots of seams and such they don’t like to lie flat. Use a spray starch to get them to stay nice and flat. I recommend Best Press. You can find it at JoAnn’s or online. I know it’s a bother but it’s a very important step. With stars I like to press the seams open. I find they lie flatter, but you’ll find what works best for you. Don’t skip this step. It’s important. There are also some videos on YouTube that will help you. I’d suggest searching for “joining together pieces blocks” or something like that. thanks Patricia for your speedy reply. Being self taught I just love the wonderful sharing global quilting community! I’m sorry to say that I did trim my stars down so now I’m feeling really upset! If you have any further wisdom of how to resolve this I’d be grateful otherwise its probably going to sit on my sewing table until I have the courage to revisit and find a work around! I have pressed and starched the stars so ok on that score. Well, it’s a mistake we all make in the beginning. You can still sew them together but the tips of the stars will be cut off. You can still enjoy it as your first quilt. This is a bit of a challenge for a first quilt, so don’t beat yourself up too much. I decided to resew the little stars as I knew I wouldn’t be happy otherwise! Life is about learning and I’m already happier with how much neater my stars are. Hopefully it’ll be five for next Christmas! I wish we could post pics here. I’d love to see what you’ve done.